While wedding cake is my favorite detail (to both eat and discuss! ), you can't ignore the beauty of a perfect bouquet. When she's walking down the aisle, holding her bright, colorful bundle, that's elegance right there. 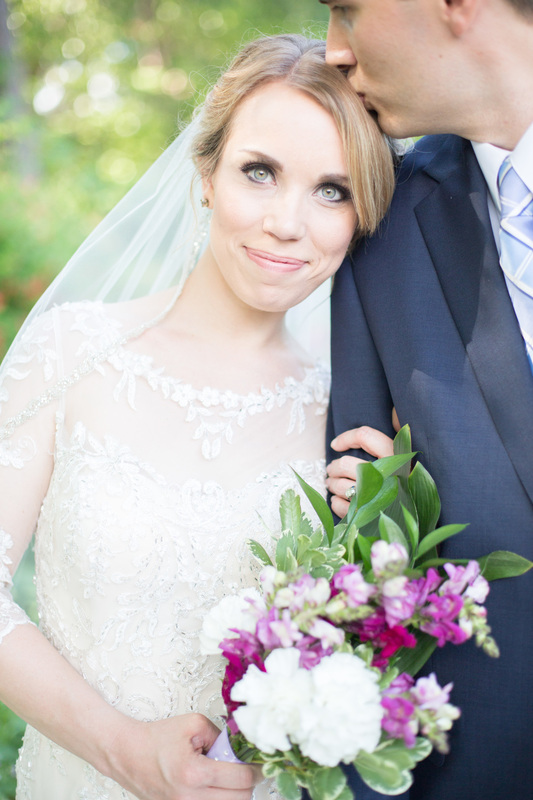 The way the dress, veil, and bouquet all go together...ah, just lovely. I thought I'd take a moment to celebrate the diversity of the modern day bridal bouquet. Before we get there, how about taking a little walk down memory lane with one of my all time favorite bouquets. Princess Di's bouquet was cascading, to say the very least! Dani showed me her bouquet the day before her wedding. She was concerned it was too large, but really, it just had a lot of pizazz! In this picture, it is the perfect color, perfect shape, perfect size! Regan's bouquet and other wedding flowers were made by her best friend's mom. I remember being completely blown away when I saw them for the first time. All of them, especially Regan's, had such movement to them. While I can't tell you all of these flowers are called, I can tell you that eucalyptus because a favorite of mine on this day. Katie's bouquet was the perfect ray of sunshine on the rainiest of days. Sunflowers remind me of her so much because she didn't stop smiling. Sunflowers are the happiest of flowers and I think they are a good choice anytime, anywhere. This one holds a special place in my heart. Daytona made this for the very first shoot we did together. I was stressing over not having a florist, but being her experience, observant self, she had photographed many dozens of bouquets. She knew what looked good. I love how wild and free it was. Absolute perfection. The best part about bouquets is that each one is different. Every girl has her own taste, and every floral designer has her own specific style.